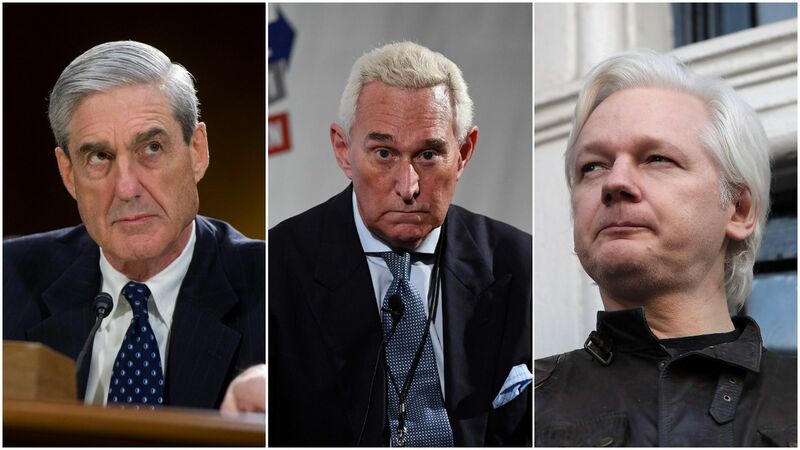 Roger Stone has long been reported to be under the microscope of special counsel Robert Mueller for possibly acting as an intermediary between the Trump campaign and WikiLeaks, which in 2016 published thousands of Democratic emails hacked by Russian intelligence operatives. Driving the news: NBC News has obtained text messages that appear to show radio host Randy Credico sending Stone updates about WikiLeaks founder Julian Assange’s plans to release Clinton campaign emails, days before they were published. Stone has claimed he never spoke directly to Assange, and that Credico, who writes in the text messages that he is best friends with Assange’s lawyer, functioned as his intermediary. Mueller is reportedly investigating whether Stone has tried to intimidate Credico, who as a witness to the investigation has contradicted Stone's version of events, per the WSJ. What he's saying: In a statement to Axios, Stone said, "Consistent with my testimony, nothing in these text exchanges suggests that I knew of the source or content of any of the allegedly stolen or hacked material released by Wikileaks." June 12, 2016: Assange says he possesses and is prepared to publish emails from Hillary Clinton. June 14, 2016: The Washington Post reports that the Russian government has hacked the Democratic National Committee's computers. July 22, 2016: Wikileaks publishes thousands of hacked emails from the DNC. Aug. 8, 2016: Stone claims in a speech that he has communicated with Assange and he believes "the next tranche of his documents pertains to the Clinton Foundation." Aug. 18, 2016: Stone walks back the claim that he has spoken to Assange and says he has only done so through an intermediary, who he later names as Credico. Aug. 21, 2016: Stone tweets, "It will soon [be] Podesta’s time in the barrel. #CrookedHillary." He later testifies to the House Intelligence Committee that the tweet was based on opposition research given to him by InfoWars journalist Jerome Corsi, which Corsi obtained through public records. Corsi said on Monday that he is expecting to be indicted by the special counsel for perjury. Oct. 1. 2016: Credico texts Stone, “Hillary’s campaign will die this week,” days before WikiLeaks founder Julian Assange's plans to release Clinton campaign emails. Oct. 3, 2016: Stone tweets, "I have total confidence that @wikileaks and my hero Julian Assange will educate the American people soon #LockHerUp." That day, he attempts to contact Trump campaign chairman Steve Bannon about Assange's plans, according to emails obtained by the New York Times. Oct. 4, 2016: Assange tells reporters he plans to release "significant material" over the next 10 weeks, some of which pertains to the U.S. election. Bannon emails Stone asking what Assange is talking about, according to the Times. Stone repeats what Assange told reporters, which is that Wikileaks will release "a load" each week going forward. Oct. 7: Wikileaks begins posting Podesta's emails, hours after the infamous Trump Access Hollywood tape is published by the Washington Post. Oct. 13, 2016: Wikileaks tweets that it has never communicated with Stone. Later that day, Stone messages Wikileaks accusing the group of publicly attacking him, according to messages obtained by The Atlantic. Oct. 15, 2016: Stone messages Wikileaks again, telling the group, "You need to figure out who your friends are." Nov. 9, 2016: The day after Trump is elected president, Wikileaks DMs Stone, "Happy? We are now more free to communicate." March 17, 2017: Wikileaks tweets that the group and Assange have never communicated with Stone. Sept. 26, 2017: Stone testifies to the House Intelligence Committee and denies ever having directly communicated with Assange. He has since amended his testimony three times, including once to reveal he met with a Russian national in May 2016 who offered dirt on Hillary Clinton in exchange for $2 million from Trump — which Stone turned down. The bottom line: The publicly available evidence has Stone walking "the fine line between intermediary and co-conspirator,” federal prosecutor Elie Honig tells The Atlantic. But Stone himself has said he is "prepared" to be indicted by the special counsel, claiming Mueller may "conjure up some extraneous crime" in order to silence him or compel him to testify against the president.